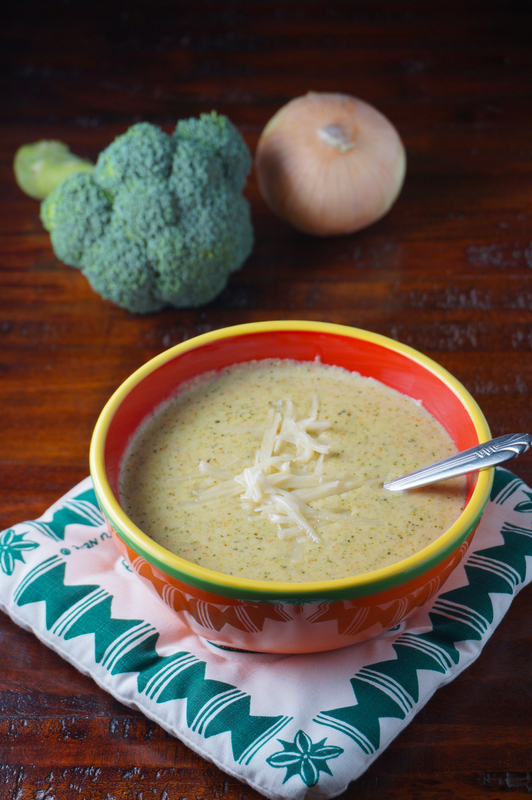 Broccoli cheddar soup is the taste of an efficient workday. It’s the taste of being in a place without obligations, surrounded by the hum of conversations that have nothing to do with me. That’s because broccoli cheddar soup is the lunch I usually order at Panera Bread when I clear out of the house so I can get a lot of work done. Sometimes, to make things happen and meet your deadlines, you have to be in a place where there are no dishes or laundry or doorbells, where you can walk up to the counter and have somebody else dish you up a bowl of soup. But these are fairly rare occasions, and in the fall and winter, I want soup more often than I need a trip to Panera. So I recently attempted to make my own broccoli cheddar soup. Melt the butter in a large soup pot. Add the chopped onion. When onion is soft and golden brown, add flour and stir, being careful to blend fully without scorching. Slowly add the cream, and then the chicken broth, bay leaves, nutmeg and salt. Simmer 20 minutes. Add broccoli and carrot and simmer an additional 20 minutes until soft. Let cool slightly, remove bay leaves, and transfer soup to a blender. Blend until carrots and broccoli are finely chopped or pureed. Return soup to pot. Add cheese, and stir until melted.